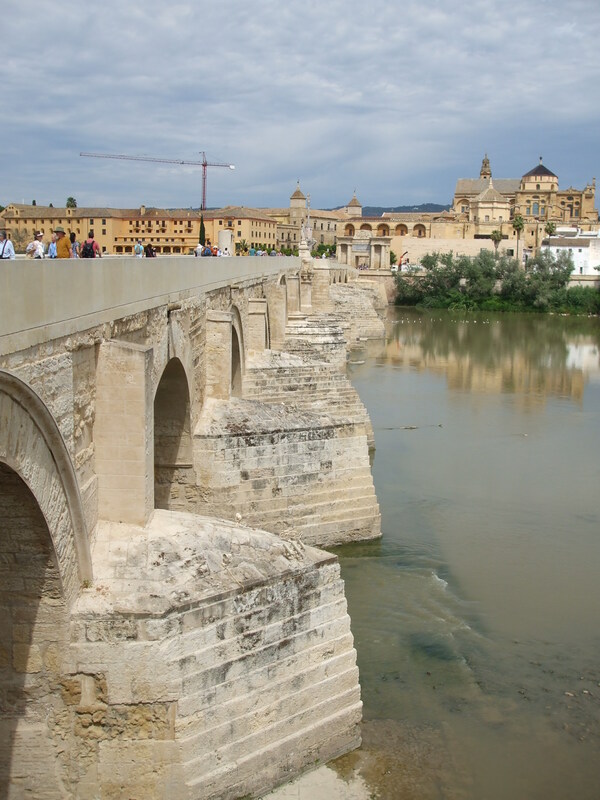 Córdoba is a beautiful city, marked by different cultures over the years and situated on the River Guadalquivir at a point where it is no longer navigable. It has the reputation for having the highest summer temperatures in Spain and is famous for its great monuments lincluding the Mesquita/Mosque, and a lovely old Jewish centre. It is now a UNESCO World Heritage Site. 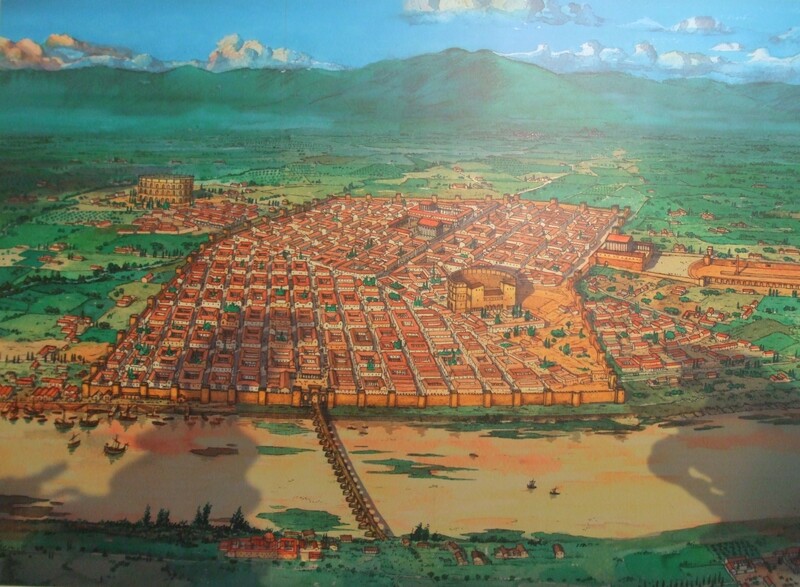 The city began as a small village in the Copper Age (3500-2300 BC). In 161 BC the Romans established a permanent camp on the banks of the river and two centuries later it competed in magnificence and importance with Rome itself. 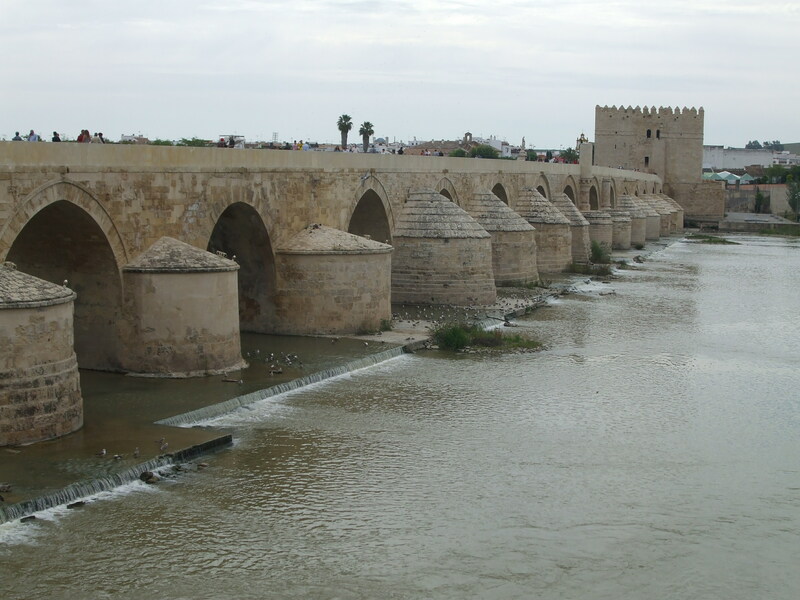 There was a large Forum, the usual walls and gateways, and a bridge, the Puente Romano across the river. 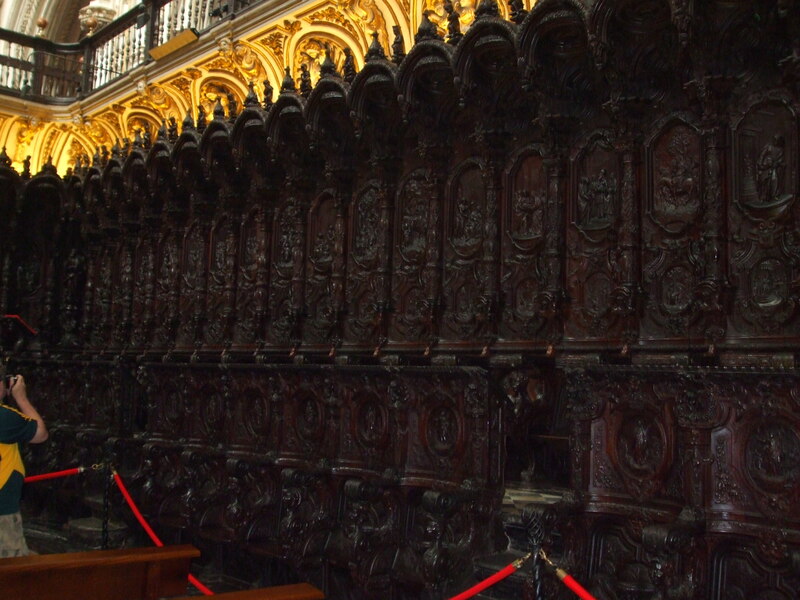 It was during this time that the famous Córdoba Treasure was buried, and is now housed in the British Museum. The following two pictures are from the wall in a Visitor Centre on the far side of the river. 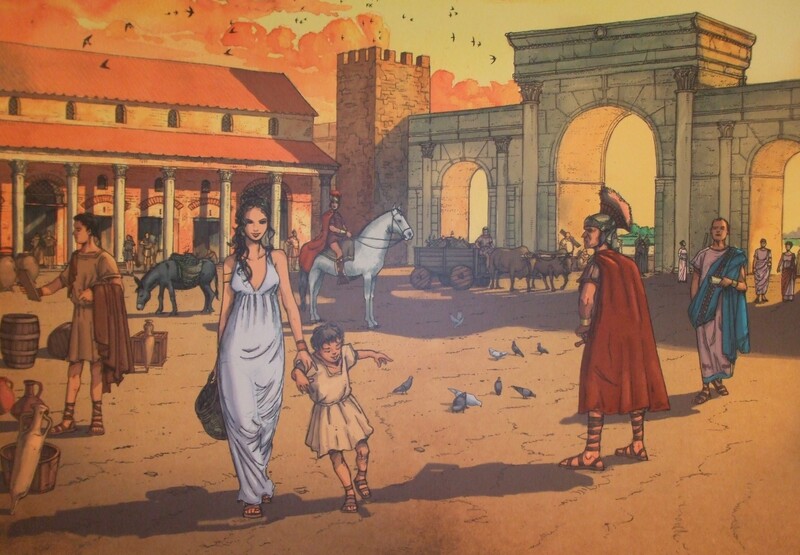 The first is a plan of the Roman town, the second shows the Forum. 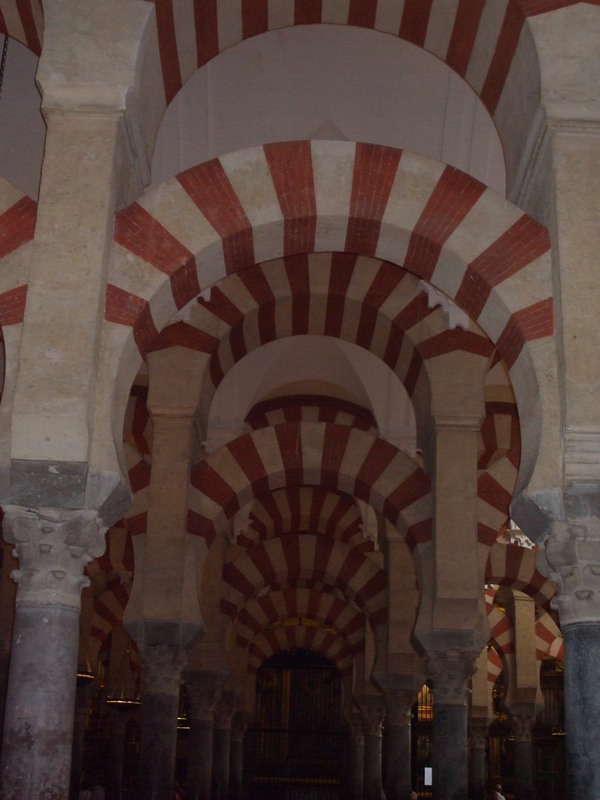 Cordoba had at least 5 squares. The oldest, the Forum, existed around the mid 2nd century. The Forum was the centre of administrative and civic activity. 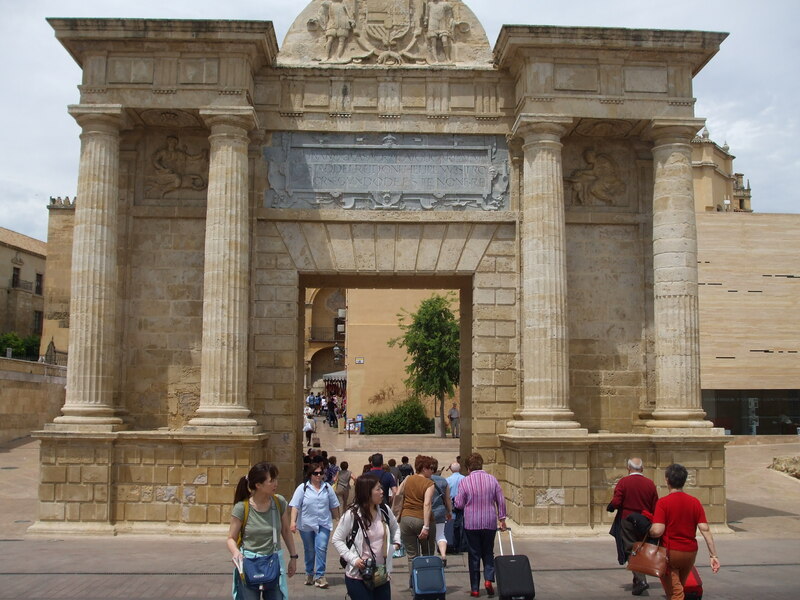 After the fall of the Roman Empire, the Moors arrived in Spain in 711 and Córdoba became their headquarters. By the 10th century it had become the richest and most sumptuous city in the known world, with many libraries, medical schools and universities. 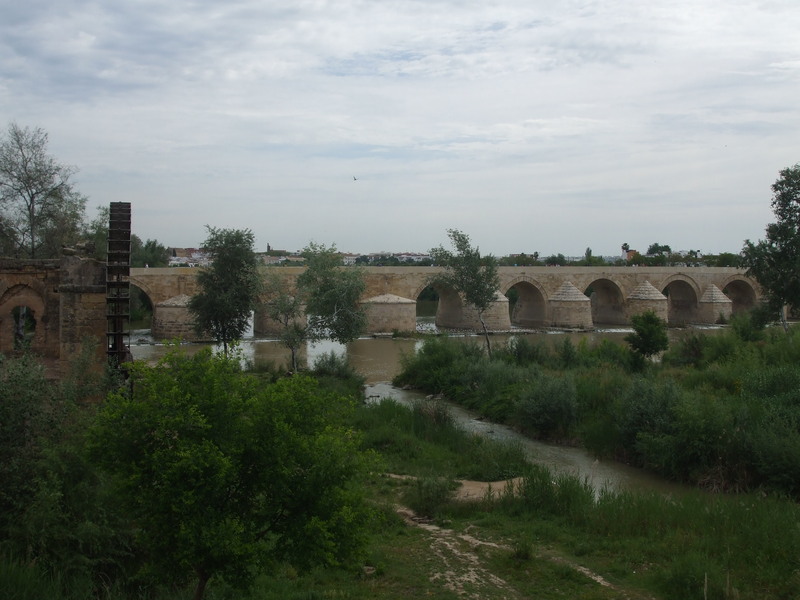 The previous picture also shows the islands downstream of the Roman Bridge. Today these are inhabited only by birds, but the remnants of flour mills can be seen on some of them. 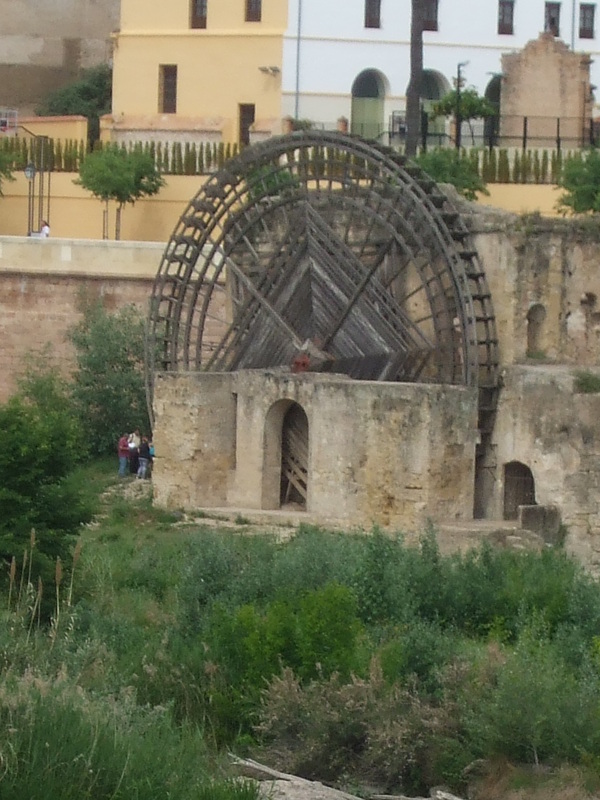 One larger mill, still with its wheel, is located close the the bank and is known as the Albolafia Water Wheel. Built by Abd al-Rahman II ( (731–788) to pump water up to the Emir’s Alcazar/Palace, it lasted until the 15th century when it was dismantled on the orders of Queen Isabella (Isabel La Católica, wife of King Ferdinand). She claimed she didn’t like the sound of the noisy chains so close to the Palace. 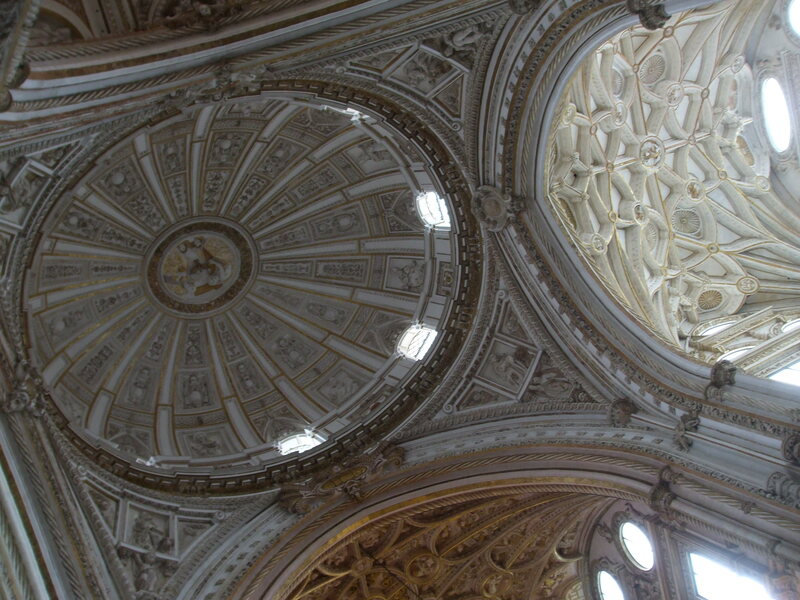 One of the main, Moorish attractions in the town is the great Mezquita-Cathedral, or simply La Mesquita. This is a view of it taken from the Roman bridge. The site on which the Mezquita stands has long been a sacred place. 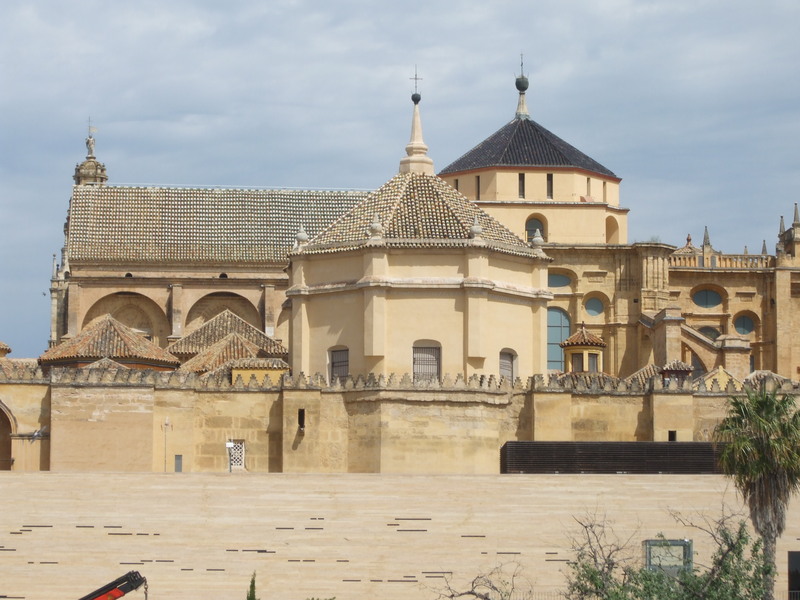 First a Roman temple then a Visigoth Christian church occupied the site, and after the Moorish occupation, the building was initially used by both Muslims and Christians. This arrangement stopped when Caliph Abd al-Rahman I purchased the Christian half. He had the entire building demolished in order to build the Great Mosque. Its construction lasted for over two centuries. 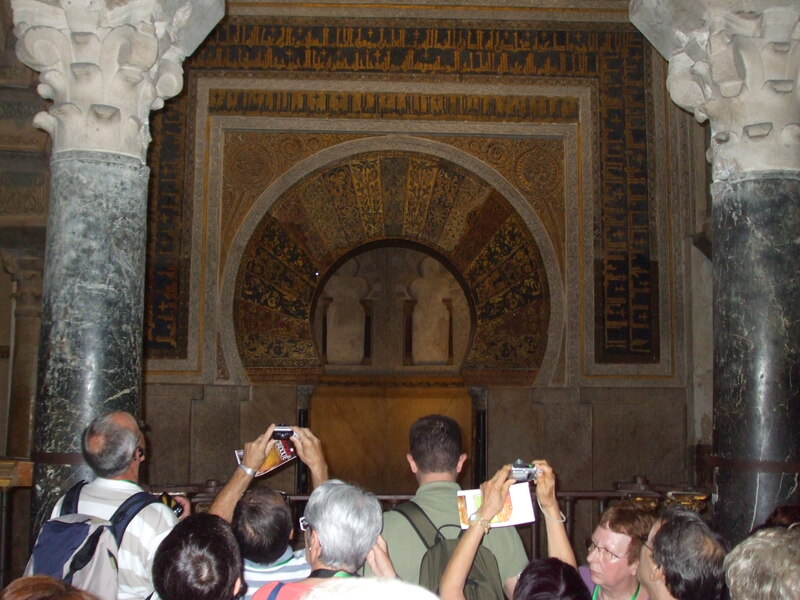 These photos inside the Mezquita show the wonderful Moorish design. The first two show the hypostyle hall (hypostyle meaning filled with columns). The Mihrab, the famous horseshoe-arched prayer niche. Mihrabs are used in a mosque to denote the wall that faces Mecca in Saudi Arabia. 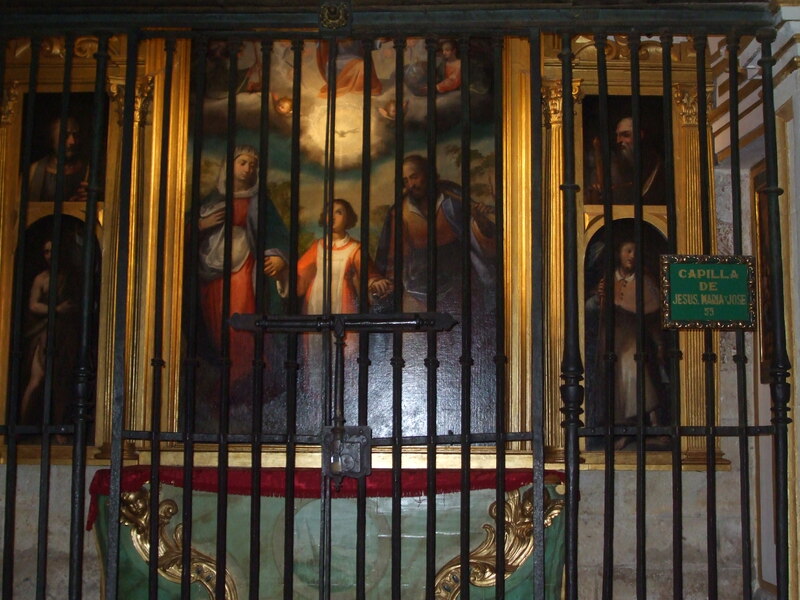 In 1236, Cordoba was taken by the Christians and, for a while, the building again served both Christains and Muslims. 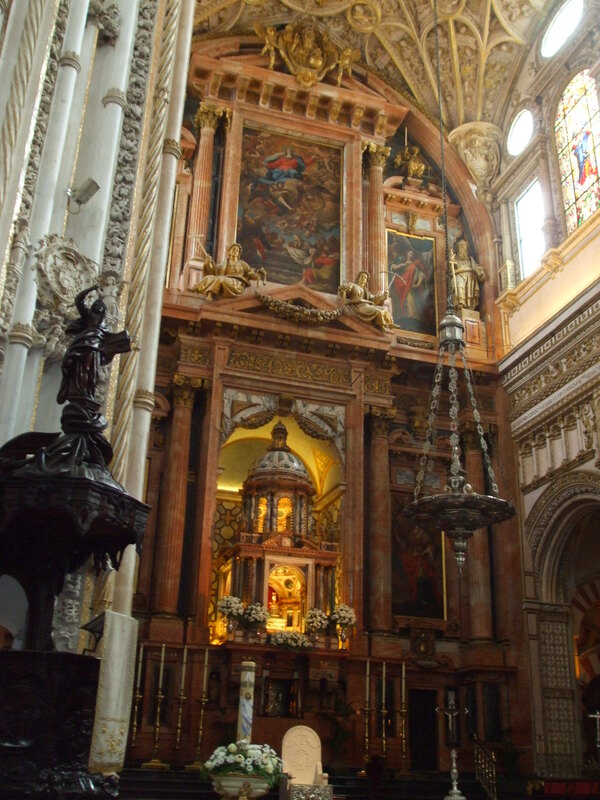 In the 16th century it officially became the Cathedral of Saint Mary of the Assumption. It is right in the centre of the mosque, and it seem odd going through one to the other. However, it’s undoubtedly a magnificent and ornate affair. Oh my goodness such wonderful and beautiful places to visit! Beautiful photos, wonderful, interesting history. Seems you had a great working vacation and are rested and ready to get back to writing. Amazing photos & enriching account of the places! very insightful! I love all of the pictures, the one of the bridge in particular! Awesome! Beautiful Cathedral as well! It’s a very unusual design, isn’t it? I believe only the foundations are the original Roman ones. But they kept the rebuilds the same as the original design. Your daughter was in a wonderful area for her uni years. I have never been to these places, my girls have been to France, Spain, Germany, Sweden and a few other places but I am the mom staying at home base and encouraging! Most of our travelling has been since the children all left home, Lyn. We would never have been able to see the world before due to the cost, for one thing! We now have a ‘Places to See’ list (ha!) but we know we’ll never manage to see most of the. But we can dream… Being a stay at home mom and encouraging your children can never be a bad thing. Your girls are fortunate to have been to so many places.